Science in the era of Facebook and Twitter - a whirlwind of hypes and likes. 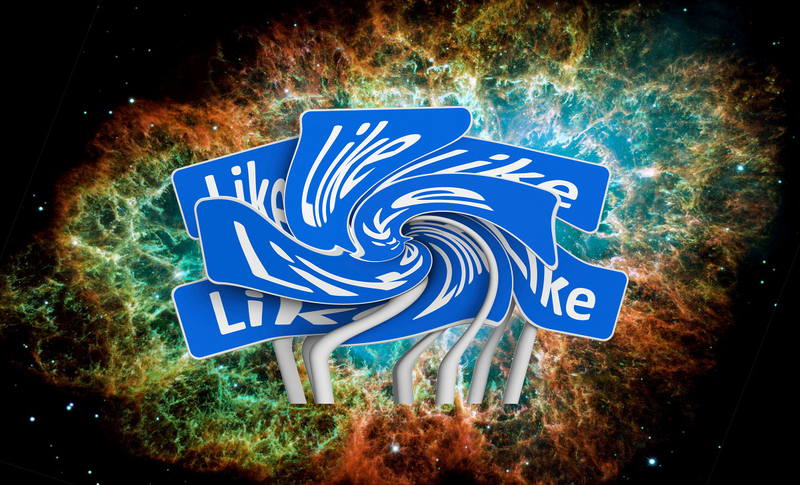 Science in the era of Facebook and Twitter – a whirlwind of hypes and likes. “Science is wrong, most of the time” – I am not sure who said that first, but I am sure someone did so well before me. This is a banality for those who do science at the forefront of our knowledge, yet sometimes it seems very difficult to also accept that view in the public discourse. Well, in the days of Facebook and Twitter it is plain obvious to everyone. As an active astrophysicist I had to reflect on this, while a number of big and small events were accumulating. It all started with a press conference at Harvard where astronomers announced that they found evidence for cosmic inflation. This news quickly spread over the entire world via Twitter and Facebook and it was hailed as spectacular evidence for the big bang by the regular press. Just a few weeks later people aren’t so sure anymore. In fact, I personally think that the measurement is impressive but insignificant at this stage (due to foreground uncertainties that are impossible to quantify right now – but, I too could be wrong, of course). This morning the SWIFT telescope announced a new gamma-ray source in the nearby galaxy Andromeda, that was picked up by news sources, Twitter, and Facebook well before most scientists did. That source would have been very interesting indeed. Alas, it turned out not to be there. That fortunately happened so quickly that neither print media nor TV could report it. Clearly, in the past there were other major false alarms that (astro)physicists remember, such as the announcement of faster-than-light neutrinos, life on Mars, or cold fusion (which actually occurred in prehistoric times). So, what is going on? Does science lose its credibility? At least that was a question I was asked by our university news paper in connection with an ongoing debate here. My answer was that we – scientists, media, and general public – need to learn how to handle science in the era of social media. It is not as it used to be. Scientists are no longer the almost omniscient divine beings that, thanks to their unchallenging wisdom, hover well above the ground that absorbs normal mortals. Failure is part of the scientific enterprise. It is good that some scientists stick their neck out and dare to claim something. However, it is equally good that other scientists try to chop these heads off – with counter arguments. That is proper science and cherished academic tradition. Scientific truth is not the outcome of a single Eureka moment but of a long sociological process and hence it is subject to all human deficiencies. This is no news and has been said many times before, but scientists, media, and general public tend to forget too often. Well, social media reveals that just too clearly. In the past most scientific debates would take place in academic circles and results would only gradually diffuse into the general public. Now the information transfer is instantaneous – often not filtered by journalists, who can only follow the wave rather than steer it. Is that a problem? It may seem so in a society where science seems more and more optional and becomes part of the entertainment and political circus. The consequence: science is becoming defensive. In subjects like climate change, vaccination, evolution, but also more ethics-related issues such as stem cell research, there is either a vocal minority or sometimes even a silent majority of the general public that questions scientific positions. Moreover science is big business for large institutions and groups. That raises suspicions and the scientific credibility comes under pressure. Every additional false discovery, immediately amplified by social media, may shatter that credibility further. So, what to do? Shall we dig in and stop sharing our latest finding with each other and with the public? Or shall we stop making claims and just publish highly polished results? The latter is, in fact, something that big science collaborations have adopted as their working model and it may become the model of the future. Too much money is at stake. However, I prefer honesty. Let’s simply get used to the fact that science can be wrong – and that scientists can be wrong – without dismissing immediately the entire body of scientific knowledge. Scientists should not be made afraid of making claims and also not be made afraid of being wrong. Being wrong is as much part of our job as is losing part of being a football player. I am convinced, if scientists are less arrogant and more honest about the inner workings of science, credibility will naturally prevail in the long run. However, we probably need to develop an etiquette on how to communicate science results and how to involve the public in the scientific process these days. For example, announcements like that of a sudden outburst of a cosmic source need to get out as soon as possible to the community, so others can react before the flare is over. In the case mentioned above, the SWIFT team did nothing wrong. They communicated their result as they usually do: swiftly and properly. The event turned out to be a glitch; that is not normal but can happen. Any media reporting on such events has to make its own choice: either be too late to report or report on something that is premature. To make this call hire and train good science journalists and do not be afraid of correcting your story if it goes wrong. Very different, however, is the story of the Big Bang result. It was presented in a press conference as “first direct evidence of cosmic inflation” accompanied by a rumor-based social media campaign. Nobel prize winners were invited to be present at the data release and soap-opera style reality TV movies about potential Nobel prize winners went viral. The authors of the paper asked for the media and social media attention, they got what they asked for, and they will have to carry the consequences – potentially together with the rest of the community if it turns out to be wrong. The paper in question had not been submitted to a journal and was not yet refereed by experts, but instead it was released to the entire world together with a very bold claim. Many colleagues hailed that as a major step towards openness and a transition from traditional publishing methods to modern swarm intelligence and social media based interaction. I think that is crap – or at least naive. The procedure was primarily adopted in order to beat others (e.g., Planck), to secure a dreamed-of Nobel prize for whoever, and perhaps to secure tenure and other jobs for collaboration members. Does anyone really believe none of these thoughts played any factor in this story? Science can be a fierce competition and our Harvard colleagues certainly know very well how to play that game. 1) If you want to use the web to referee your work, then do so, but be defensive. Make clear that this are preliminary results, subject to discussions. Let the process take its course and then have a press release summarizing the conclusion at the end. Any ensuing media frenzy is their problem – let the media and the web find a way to deal with the process and get used to it. 2) Or, have it refereed thoroughly and traditionally and then have a press release or even a press conference organized by your institution, following some clear ethics rules. In case of an extraordinary claims, editors of journals should be very careful in selecting a number of very different referees, rather than be very quick. Still, be humble in your claims as author. 3) Finally, you can release it to the media before submission, but then make clear that this is just one possible explanation, an interesting hypothesis, a contribution to the discussion. The media needs to learn to understand and report that properly. Certainly, refrain from press conferences, emotional youtube videos, etc. in this case. Which method you choose (I have chosen 2 and 3 already) also depends on the enormity of the result. If you really have Nobel-price winning results (which I haven’t had yet), then Method #2 is perfectly fine – you will get it in any case. If you don’t, also the biggest press campaign will not get you one. Above all, let’s make clear that science is an ongoing discussion. It can benefit a lot from social media interaction with each other and the public. However, that automatically requires honesty, less agitation, more understanding from the public, and a sense of humility among us scientists. In the end, however, it makes us vulnerable – whatever we do. We also need to learn to live with that. Previous Previous post: Photo of your vote? Show respect to democracy, don’t do it! Very succint and to the point. I think that This “quest for fame” is spreading in academia, and is being supported by the management too. When funding is becoming more and more scarce, people are adopting less than honest tactics to get forward. We should put these practices in the limelight and expose them more; scientiffic integrity is in question. Another prominent case a few years back was the claim that NASA scientists have found bacteria which have swapped phosphorus with arsenic in their DNA. It was encouraged to go ahead by NASA instead of being carefully reviewed before the presser. Tenure pressures and the “being cool” and “first” were likely the contributing factors. Science is not reality TV. The SWIFT situation is not really analogous to BICEP2 – GRB data is released in real time in order to facilitate fast optical followup of transient events, so there is very good reason for putting this in the public domain. As things like that happen in the modern day and age same as ever, humbleness isn’t really keyword here, is it. I think that the “Science is always wrong” attitude springs, in part, from a culture in which Science is treated in the media as infallible as religion (ironically at the same time that the words “Scientists” and “Baffled” are daily seen in headlines). People might better accept that scientists can be wrong without being anti-science/anti-scientist when they’re not told that science is infallible after a long history that shows that scientific paradigms change and evolve as we learn more about the universe. In today’s world, I can imagine how the rush for first discovery can be problematic for public to learn of something before it has been tested and even documented by scientific peers. There has always been a heavy competition to most fields of discovery. Just now social media has made it so easy to just hypothesize and have others believe it to be a documented finding. I am more of that observer that tries to figure out if something I read is true or not (on social media). The thing I have found is that people will believe what they want to believe even if it is proven wrong, in the main stream of social media. I can’t see anyone getting a nobel prize without having documented evidence and proven data to substantiate the claim of whatever it is they discovered. What I am seeing most is people believing rumors and spreading them via social media and there is no ending that. It is unfortunate that the progress that has been made in technology has made that possible. I liked how poster has suggested 3 options for the scientific community to proceed in light of the situation with social media. I would elect to keep my findings private until it could be judged and debated by peers. Rushing out to post it seems a bit of asking for something to get blown out of proportion. I don’t know though, if you post something scientific that is not been reviewed properly, you will almost certainly have it distorted to what someone wants to make of it then reposted and the entire concept has changed. Even if you disclose things in a manner of suggestion people will still change it. So I myself think the only place one could be accredited is by getting published in a journal of science before releasing any details of what it is you have explored and found. It certainly is an interesting subject. After all even when science has proven facts there will always be the anti science believers spreading rumors that even facts are not true. I admire science and scientists who do the work I wish you all the best of luck obtaining recognition for your work and even a Nobel! Excellent post, thanks! Although with regard to suggestion #3, I wouldn’t be surprised – even with the disclaimers – if the information still gets reported as “Scientists prove”, or some kind of phrasing that completely overlooks the preliminary nature of the findings. You mentioned that science is becoming ‘defensive’ referring to the sociological dimension of scientific theories and beliefs. As a trained philo-socio person (whatever that means) I find these statements refreshing and reflective. Others may see them as pure heresy. All I can say is I am glad you wrote this post. Thank you. I think the main issue with how science is presented to the general public has to do with the fact that new scientific hypotheses are often presented in a way that fails to mention that they are simply hypotheses. This tends to mislead the general public into thinking that the scientific process is complete and that everything scientific is set in stone. The media, of course, whether it be social or news, is notorious for this. The world of science is continually changing; in what it supports and what it doesn’t support. But this is the essence of science in and of itself. As you mentioned, we are only humans. Science is simply our way of knowing and attempting to understand the world through the process of trial and error. For the public the distinction between those people faking scientific terms to describe miracle cures for their own gain, and scientist claiming new breakthroughs happening all the time has gone. And often the fakes are trusted better. Real claims are being thrown in with the jumble of overwrought discoveries. For the non-scientist in power (as there are none or few trained scientists in most governments at its highest levels) other criteria, i.e., financial, political, are more real than all that scientific chatter. I think that your suggestions are nice, but most people do not do nice they are in it for money and fame and we will just have to live with it (the new media). In the case of Swift, the continuing reductions in funding mean less people are standing by now and there is more automation, so if anything goes wrong, a wrong alert goes out. As you say, that is acceptable. It is up to the people receiving the alerts to read them carefully and use some common sense. Do we still follow science in this new day and age of researching? A fascinating article. In this day and age preliminary results, which are a small piece of the jigsaw and may prove part of a theory are presented on media such e.g. Twitter as proving theory xyz. This is picked up by the newspapers and TV an “earth shattering finding” which is totally incorrect. A well written post on a pertinent topic – well done. I too believe that science has a credibility problem, a credibility problem that will soon manifest itself in a funding problem. However, I think the problem is more basic than the symptom you addressed. It seems there are two ways of describing things; mathematics and words. Science is fond of mathematical equations – but ordinary people (the ones putting up the money) use words. The mathematical descriptions seem to be moving at a good pace these days, and that is good. The word descriptions don’t seem to be doing so well. Without the word descriptions ordinary people have little idea of what scientists are doing and I fear they are growing tired of being dismissed as not understanding. They may not understand, but it is a mistake to dismiss them – something needs to be done. As an example to illustrate how basic this problem is consider the word descriptions of the expansion of the universe theory. Words describe observations of distant galaxies, galaxies so far away that it takes their light 9 or 10 billion years to reach us. Words describe how that light is shifted to the red side of the spectrum, and how applying the Doppler effect it is concluded that the galaxies are moving away from us. All good, except for the “are” part. I’m sure it was accounted for in the calculations, but I’ve yet to see words describing how this means “the galaxies ‘are’ moving away from us” rather than “the galaxies ‘were’ moving away from us.” Ten billion years is a long time. Such basic holes in the word descriptions cause doubt and create the credibility problem. You Professor, write well – perhaps you could fill in some of the holes. Nicely put and without bias. We must remember the media are not interested in science unless it is news and that means mind boggling stuff. The public want to read life changing news so between the two we get fantasy. Scientists being human are ambitious and some will use the media to exaggerate their discoveries. We all enjoy the benefits of science through technology but very few will admit it has brought us to a crisis. Yet the modern world is the product of science like it or not. I agree with the greatest part of the article. However, there is a point I think should be more emphasized. Science cannot be wrong. Within the limit imposed by experimental results, what we (or what we should) call “science” provides a realiable description of the physical world. Scientists can (and often, are) wrong. It is a different thing. Scientific method protects science from clamorous mistakes. One may argue that there are many contrasting experimental results, especially in physiology and medical studies. It should be clear that partial results cannot be thought as science. (More phylosofically, any experimental data is science per se). This is a quite obvious concept for scientists, which can take the liberty of free speaking with their colleagues, but the choiche of words is a delicate issue when dealing with the public. People tend to be impressed by words when they can’t completely catch an idea, so it is very dangerous to spread the message “science can be wrong”: this could be interpreted as “there is nothing sure”. This is, strictly speaking, true. However we known that similar claims have to be thought respect with the precision within claims are experimentally proven. All of us should be careful in such details.